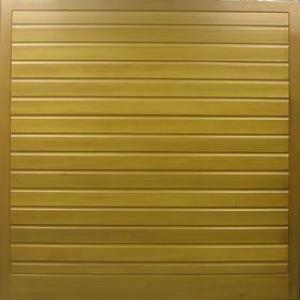 Top quality cedarwood up and over garage doors by Cedardoor at discounted prices. 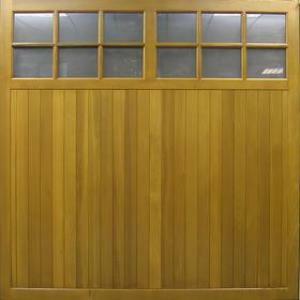 Doors and frames can be fully finished in a Remmers woodstain in a range of beautiful colours. Can come with matching cedarwood frame. 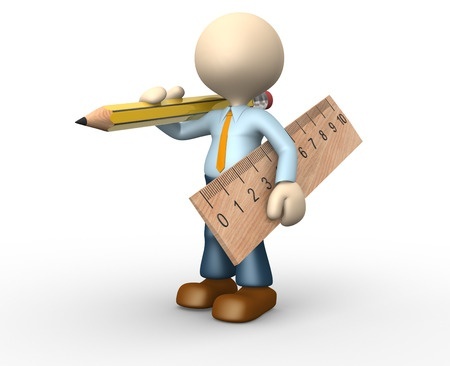 All doors made-to-measure and can be automated if required. Made in UK. 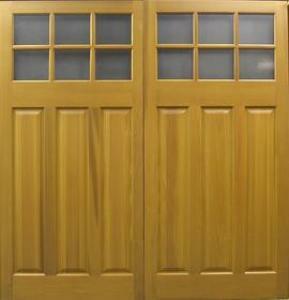 All doors manufactured using traditional techniques. Sturdy mortice and tenon cedar stiles and rails. No steel chassis, unlike other makes. Canopy and retractable counterbalance mechanism included in cost of garage door and comes pre-installed to the panel. All timber garage doors with glazing have 4mm toughened glass, not perspex. 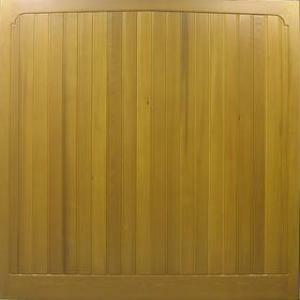 Traditional panelled version comes with marine grade cedar faced plywood panels. 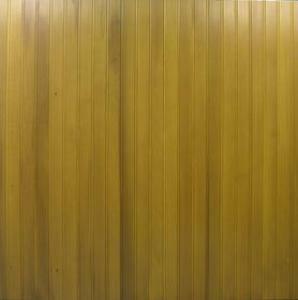 Available 6ft to 18ft wide. 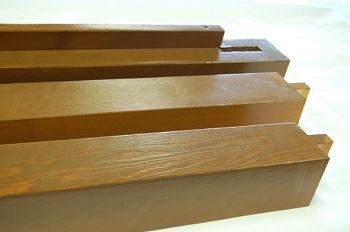 Variations on standard designs shown, available at extra cost, for customers requiring bespoke timber garage doors. National Trust conservation area and listed building approved. When installed with matching cedar or hardwood garage door frames, all Cedar Doors look extremely attractive on any property. 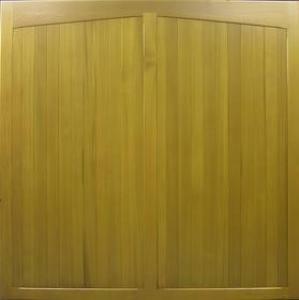 Cedar Door – the timber is sourced from sustainable forests. 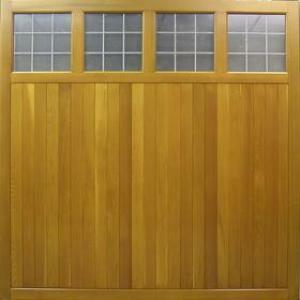 The Western Red Cedar used to construct this beautiful and wide range of Cedar garage doors grows in British Columbia, Canada plus the North American States of Washington, Idaho and Montana. Chain of Custody Certification for all timber used in the making of Cedar doors proves that all timber used is certified and traceable back to the sustainable forest origin. All forests are managed and have full reforestation programs. Cedar’s Natural Durability and Stability. Western Red Cedar contains natural oils that naturally preserve the wood, making it resistant to insect attack and fungal decay. Cedar is the preferred timber for most outdoor timber applications including quality patio decking, garden furniture, roof shingles and the external cladding of buildings. Indoor use in bathrooms and saunas bear witness to cedar’s natural durability. As important as durability, dimensional stability is very important when making a large timber product. 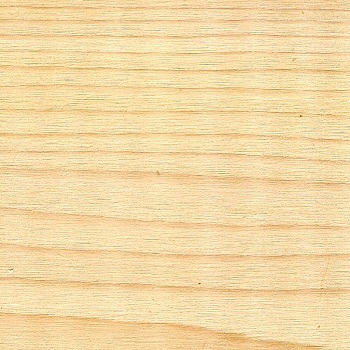 Cedar does not shrink and expand, warp, twist or cup anywhere near as much as timbers like Oak. 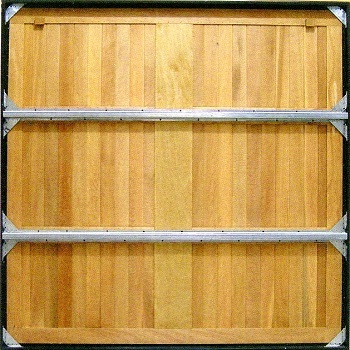 Minimal dimensional movement makes cedar ideal for garage doors. Cedar ranges in colour tone from light amber to deep honey brown. Generally straight grained with few, if any, knots. 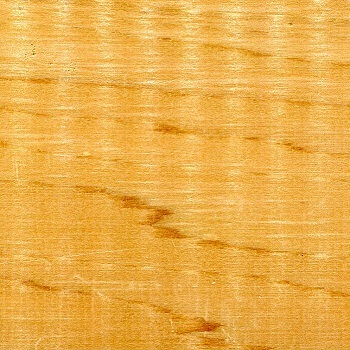 Light shade of cedar, narrow grain. 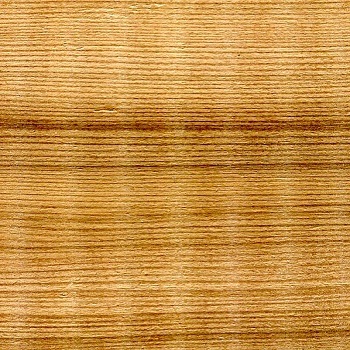 Medium shade of cedar, widegrain. Lighter shade of cedar, wide grain. 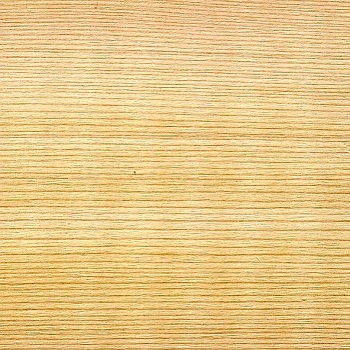 Dark shade of cedar, narrow grain. Although cedar is light in weight, it is also strong. It’s lightness is due to air spaces within it’s cellular structure, making it warm to the touch with an insulation value higher than most other timbers and much higher than steel, brick or concrete. We do not claim specific u-values on cedar garage doors due to tolerance gaps around the panels, which can leak air or draughts. 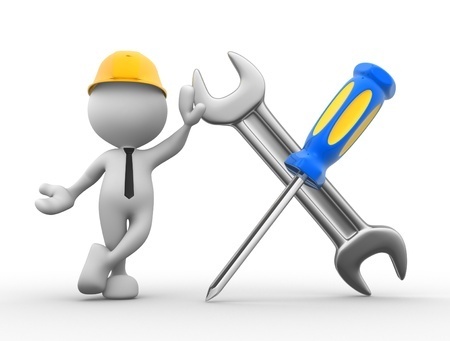 A wide range of specifically insulated garage doors can be found by clicking on the link. The Traditional and the Sherwood range. The more popular Traditional range of doors, due to their solid timber construction, differs slightly from the Sherwood range, which are constructed onto an aluminium chassis. 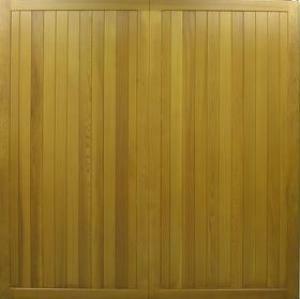 All Cedar Doors are individually made to order to suit your sizes, at no extra cost. 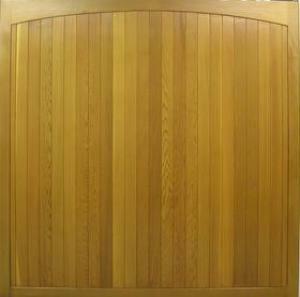 Traditional Boarded and Traditional Panelled Solid Cedar Doors. 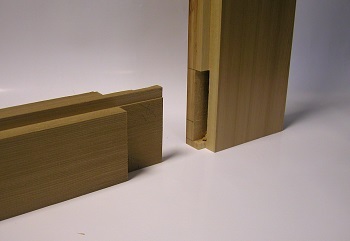 Traditional mortice and tenon joints, glued and wedged, are used to join the solid cedar stiles and rails, which make up the main door panel. The infill boarding is approximately 14mm thick tongue and groove V-jointed. 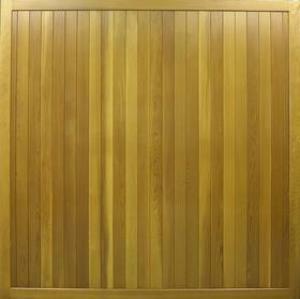 On the doors which feature raised and fielded solid timber panels, the panel thickness is approximately 18mm thick. All models of door featuring large flat panels are constructed in the same way, except that the panels themselves are made from 9mm exterior grade plywood with a cedar veneer facing. Only on wide doors are galvanized steel bracings fixed to the rear of the panel to minimize bowing of the door in the open position. Fine machining chamfered corners and tongue and groove V-jointed detail. 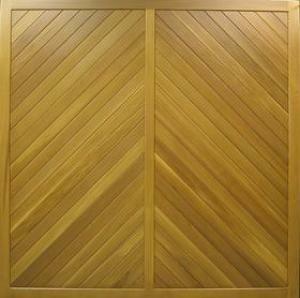 Deep raised and fielded panel detail used on traditional panelled range of Cedar Doors. Available in sizes from 5ft (1524mm) to 18ft (5487mm) wide and 5ft 6in (1676mm) to 8ft (2438mm) high. The CE approved counterbalance gear included with your Cedar Door can be canopy or retractable. Retractable gear is used on all doors over 8ft wide, or if the door is to be automated. Most Cedar Doors are fitted with an automation kit, with customers generally specifying that the door comes without a handle. Black T handles and a manual latching kit can be provided at no extra cost, if the door is to be manual. Feature handles in Brass, Chrome, Black etc., are also available at little extra cost. 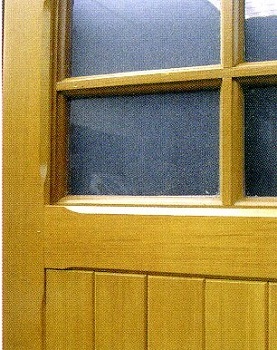 All doors come with a dip coat applied basecoat for temporary transit protection. This can be upgraded to factory applied fully finishing in any of the colours shown below, or any RAL or BS colour you care to specify. 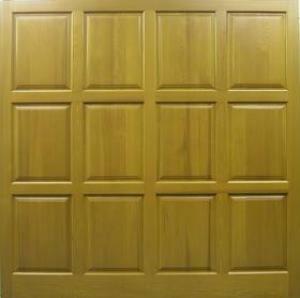 If the door is purchased in basecoat, it must be top coated prior to installation or immediately afterwards. Please see warranty details on product page. 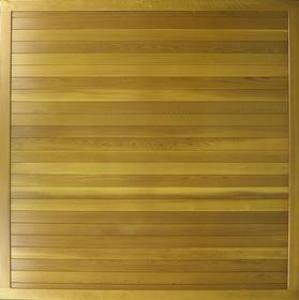 This finish can also be applied to a choice of cedar, softwood or hardwood frames. 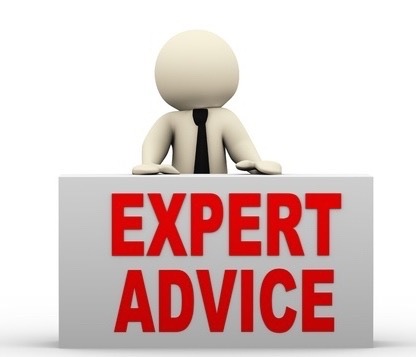 Cedar frames are not recommended on doors over approximately 9ft wide simply because the soft cedar will struggle to hold the weight of the door through the fixings. 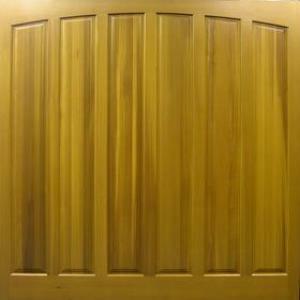 Glazed Cedar Doors have 4mm thick toughened glass in clear or stippled. Other makes have Perspex windows only, with some offering a glass upgrade. Square or diamond leaded light can be chosen on most glazed designs, if required. All the standard features of the traditional range apply, including made-to-measure, basecoated with option of fully finished, canopy or retractable gear and matching frames in softwood, hardwood or cedar. The main difference is that the door panel is manufactured using a black powdercoated aluminium perimeter chassis, with gusseted galvanized horizontal bracings. Very strong and slightly cheaper in price than the equivalent model of door in the traditional range, but approximately 10mm of the black metal edge does show all round the edge of the door. All glazing is Perspex in the Sherwood range. 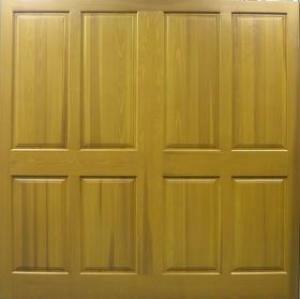 Door sizes available from 7ft (2134mm) to 16ft (4877mm) wide and 6ft 2in (1880mm) to 8ft (2438mm) high. 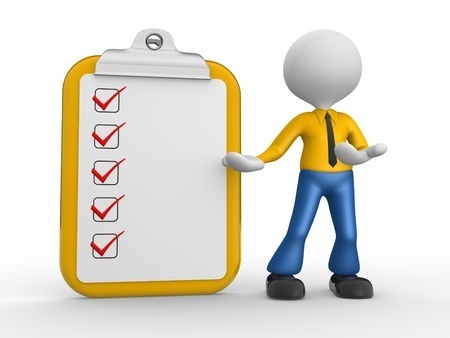 Please phone if you have any questions on 01691 670394 or send us your sizes and questions using our self survey form. Inside view of Sherwood Door.